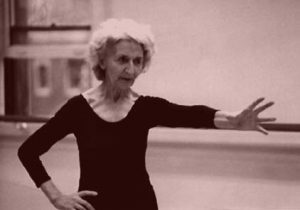 Irmgard Bartenieff (1900–1981) was a dancer, physical therapist, cross-cultural scholar and pioneer in the field of dance/movement therapy. A Renaissance woman who enjoyed weaving disciplines together, she was always ready to investigate movement in a variety of fields—including child development, ethnic dances, nonverbal communication and physical rehabilitation. One of Rudolf Laban’s star pupils, Bartenieff was among the first to promote his work in the United States, ultimately founding what would become the Laban/Bartenieff Institute of Movement Studies, LIMS® in New York City. As a physical therapist, she applied Laban’s theories and the principles of human development to her work with polio patients as well as dancers, originating a physical reeducation method that develops movement efficiency and expressiveness. The work came to be known as Bartenieff Fundamentalssm. Born in Berlin, Germany, in 1900, Bartenieff was first trained as a dancer and later expanded her studies to biology, and visual and performing arts at the university. In 1925, she began studying with Laban. Trying to find a common ground between her mentor’s movement experiences and her previous dance training, Bartenieff formed a company, the Romantisches Tanztheatre Bartenieff, which toured throughout Germany until 1932. With the expansion of Nazism, Bartenieff and her husband, Michail Bartenieff, who was Jewish, relocated to the U.S. in 1933. In the mid-1950s, Bartenieff decided to go to England to study further with Laban, and she returned every summer for five years. Meanwhile, in New York City, she taught classes in Effort/Shape for professional dancers at the Turtle Bay Music School, where she started to create the material that formed the basis for the Bartenieff Fundamentalssm. Meanwhile, excited by the possible correlations between dance styles and everyday behavior, Bartenieff joined Columbia University ethnomusicologist Alan Lomax on the Choreometrics Project, which sought to analyze dance in a variety of cultures. She worked on the project from 1964 to 1966, sharing the richness of the experience with students in her Effort/Shape classes. The foundation was being laid for the establishment of a Laban/Bartenieff approach to movement and dance. In 1965, Bartenieff and two assistants established the first Effort/Shape training program at the Dance Notation Bureau in NYC. The first certification program in Laban Movement Studies, an amalgam of Laban’s movement theories and Bartenieff’s approach, followed in 1973. This in-depth graduate-level program offered the title of CMA (Certified Movement Analyst), and over the years has acquired international prestige. In 1980, Bartenieff’s comprehensive text, Body Movement: Coping with the Environment, was published. Today Bartenieff’s students carry on her work in ever-broadening applications.